On my first deal as a new paralegal (many years ago) I was assigned by a partner to work with a new associate on an M&A deal. The assignment included working on due diligence matters and managing certain sections of the closing checklist to ensure that each of those “CPs” were satisfied in advance of the closing. Since then, I have worked on dozens of M&A transactions. What I have learned is that (i) “CPs” mean “conditions precedent” to closing that must be met before the deal closes; (ii) there are various phases of the due diligence process; (iii) that relying on a comprehensive closing checklist is very helpful to ensure the closing goes smoothly; (iv) and, most importantly, that there key administrative items on the closing checklist that often get left to the last minute and cause undue stress and fire drills at critical times before closing. In this first article of our three part series, we will look at a general overview of considerations as you organize your closing checklist in the preliminary due diligence phase, when the parties to the deal have just agreed to the general terms of the M&A deal. Part two will review practical tips to consider when you are conducting your public records due diligence and coordinating your state filings, including some real life examples of issues that can arise and how to prevent them. Part three will discuss the important steps that should be taken post-closing and consequences of not handling certain post-closing items. 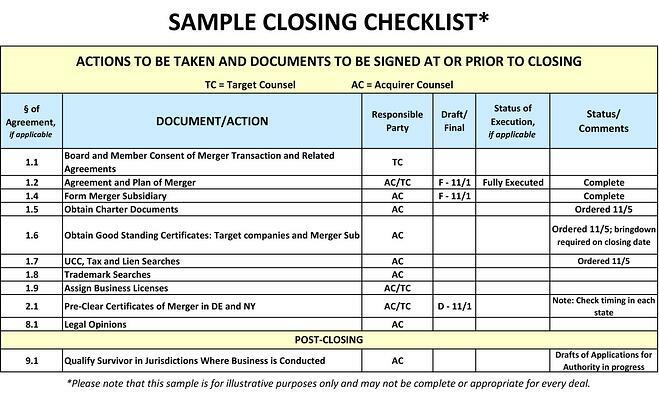 Often times a closing checklist for an M&A deal will contain key areas commonly considered as part of a buyer’s and seller’s legal due diligence investigation to ensure that there is full disclosure of all material items outlined in the Merger or Purchase Agreement (e.g., financial and legal representations, ensuring that the target company and related subsidiaries exist and are in good standing) that support legal opinions that will be delivered at closing. As a junior attorney or paralegal, it is important to track and coordinate timing related to obtaining Good Standing Certificates, ensuring that you know what annual report due dates may be coming due between the early due diligence phase and your closing date, requesting comprehensive UCC and lien searches, reviewing any business licensing requirements to assign to the buyer as early as possible in advance of closing, preparing to form your acquisition company and preparing and pre-clearing the Certificate of Merger. For all of these items, understanding the difference in timing and requirements to complete in each of the states is critical and can help you avoid unwanted delays. Below is an excerpt of a sample Closing Checklist. Reviewing the sections you will be responsible for and adding specific notes regarding timing considerations will allow this checklist to be utilized as a valuable tool to ensure you have all of your bases covered during each phase of the M&A transaction. In Part 2 of this series, we will review suggested action steps you can take as you conduct your due diligence and public record searches and filings along with tips on notes you may want to add to your Closing Checklist to ensure it serves as the most valuable tracking tool possible.